Just add water and see them hatch in 24 hours. Watch amazing live Aquasaurs swim in a prehistoric environment! Aquasaurs have existed for more than 350 million years. They're even older than dinosaurs. 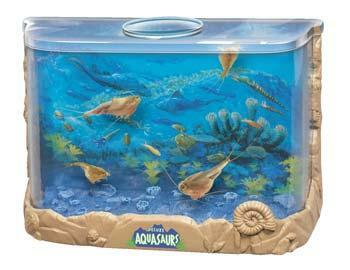 Now you can hatch and raise live Aquasaurs in a fascinating prehistoric aquatic environment. Watch as Aquasaurs swim and play among glowing undersea volcanoes. It's like traveling back in time! Lookout! There are sharks everywhere! Watch as realistic 3-D sharks seem to swim with your favorite pet fish. Then begin to explore the fascinating undersea world of the fiercest predators on Earth. Includes Great White, Hammerhead and Mako sharks. Watch Bettas or Goldfish live among the stars and planets. Retro space styling features domed space city, 3-D planets and rocket bursting out the aquarium. Fun U.F.O. aquarium cap beams alien light into the tank. Great as a nightlight too. Compact (3/4 gallon) size is perfect for desktops.